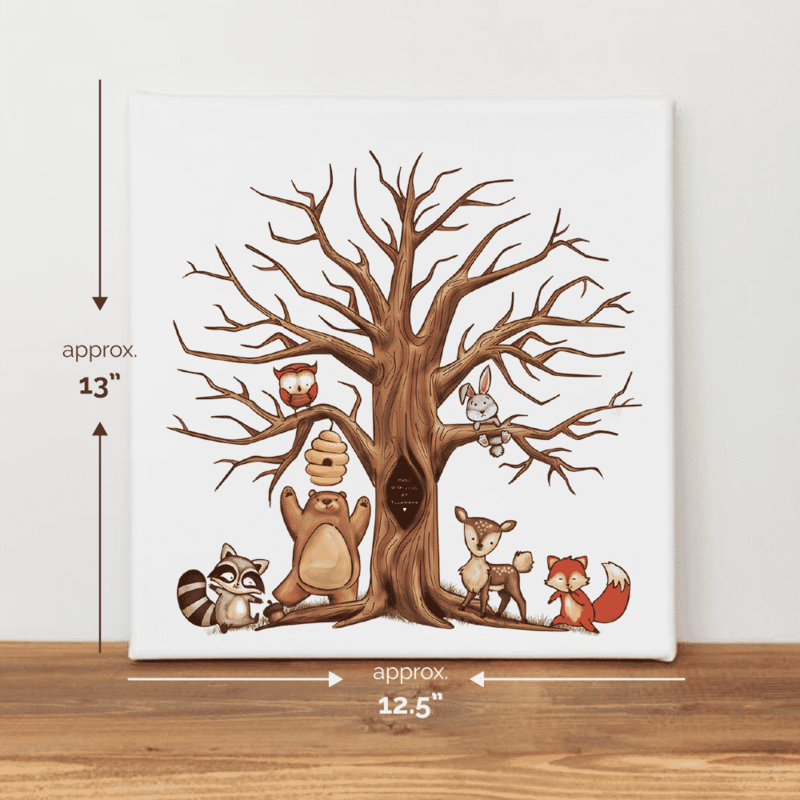 Home> The Cutest Fingerprint Tree Canvas You've Ever Seen, Period! The Cutest Fingerprint Tree Canvas You’ve Ever Seen, Period! 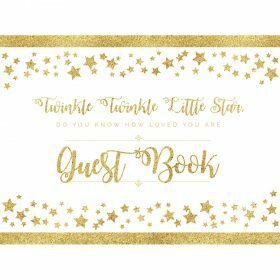 Looking for an alternative to a traditional guest book? 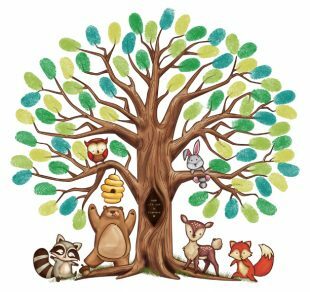 Consider this Woodland Themed fingerprint tree canvas. It’s cute and easy to set up. Tulamama’s canvasses come with everything you need. 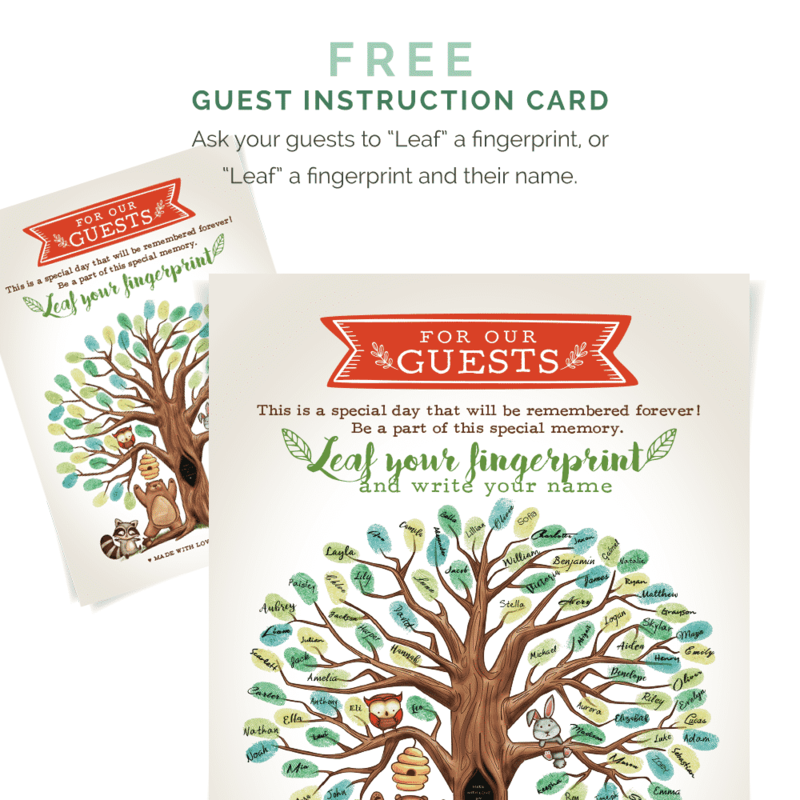 Your fingerprint tree will arrive in a gift box, without leaves on the tree. The fingerprints of your guests become the leaves on your tree. This particular design is great for a Woodland themed baby shower or birthday party. If you are creating nursery decor, your baby’s fingerprints can be used to decorate the tree too. 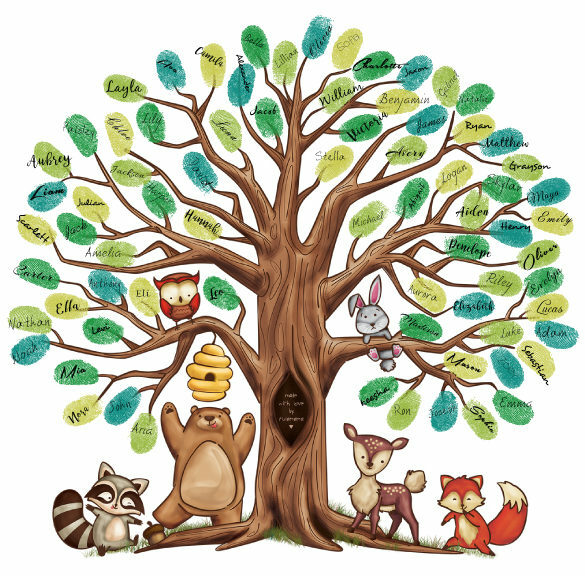 We also have a more neutral themed thumbprint tree that can be used for weddings and other celebrations. Click here to see it. 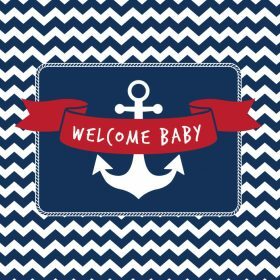 Finally – if you are new here, thanks for visiting. We are happy to have you. If you’re an old customer – we are always happy to see you again! A display for your guests’ instructions. When guest instructions lay flat on the table, they are not easy to see if there are a lot of people around your table. Setting up your instructions upright so that it’s clear to see, makes the whole process easier. A hook for easy hanging. A fingerprint tree canvas can decorate the wall. 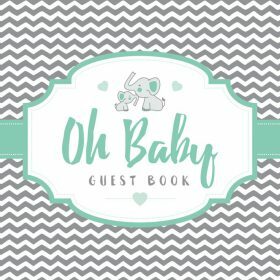 If you are using it as a baby shower guest book alternative, hang it up as beautiful nursery decor. The setup is easy and there is not much thinking involved – the hard work is done for you. We have specifically chosen classic designs for our canvasses. Our designs are gender neutral and they can be used for more than one event. Tulamama canvasses can be used for baby showers, birthday parties, or as an alternative wedding guest book. 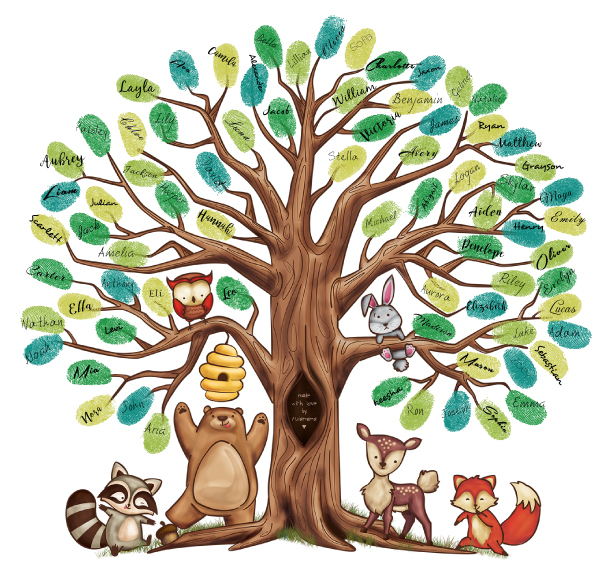 Your baby or child can also create a fingerprint tree. It is also perfectly sized at 13″x12.5″x1″ – that means, it’s not too big or too small. A keepsake is something that lasts a long time. 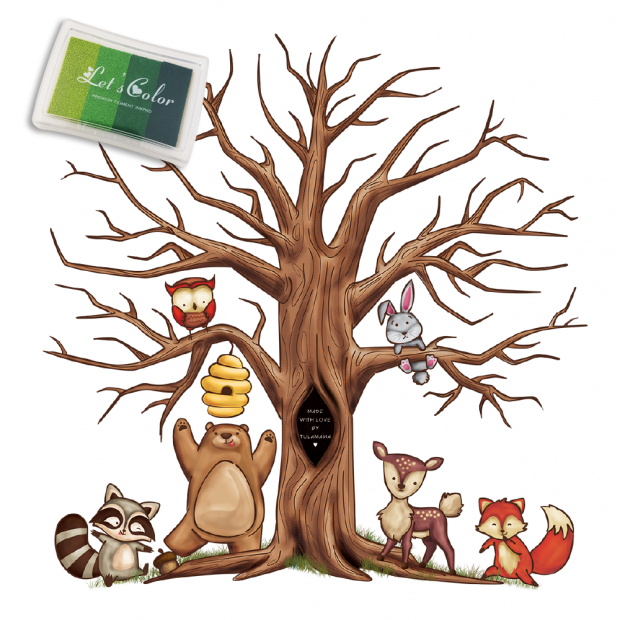 This is why our fingerprint canvas is made with real wood and durable canvas. For your convenience, your canvas is also wrapped in plastic. This is to preserve it until you are ready to use it. All purchases are made with a 100%, No-Questions-Asked, Money Back Guarantee. When you are having a baby shower or a wedding, or even a birthday party, people like to leave advise and best wishes. What’s more – recipients like to receive it. It acts as a keepsake that can be saved for years and years. In addition to your advice cards, you also get one set of fingerprint inks. They are only available in shades of green. Finally, you also get a frame, which you can use for your guest instructions. 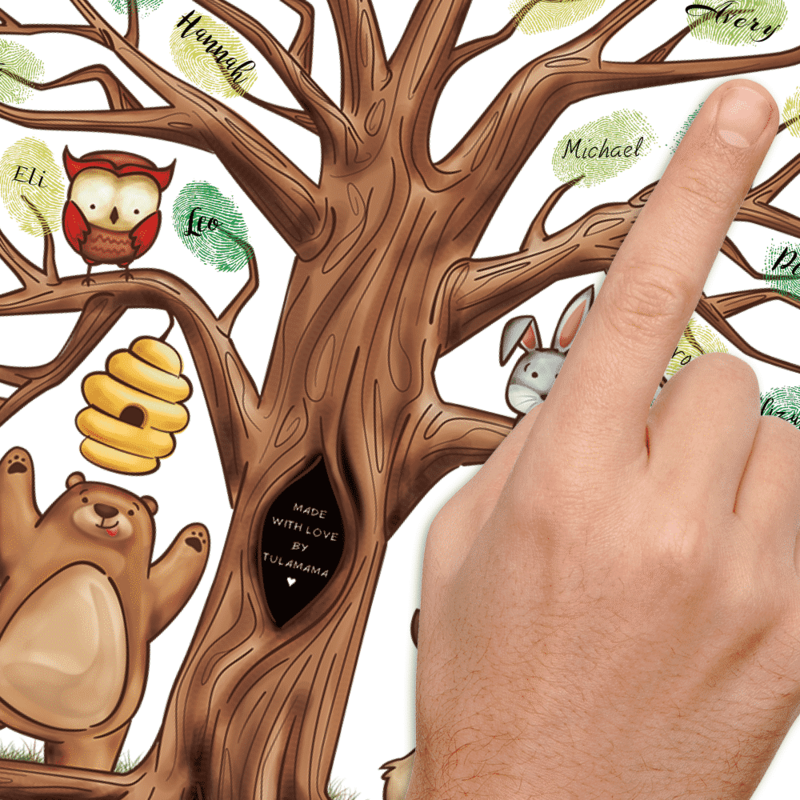 FAQ Frequently Asked Questions About The Cutest Fingerprint Tree Canvas You've Ever Seen, Period! What is the size of the canvas? The canvas comes with instructions to offer your guests. 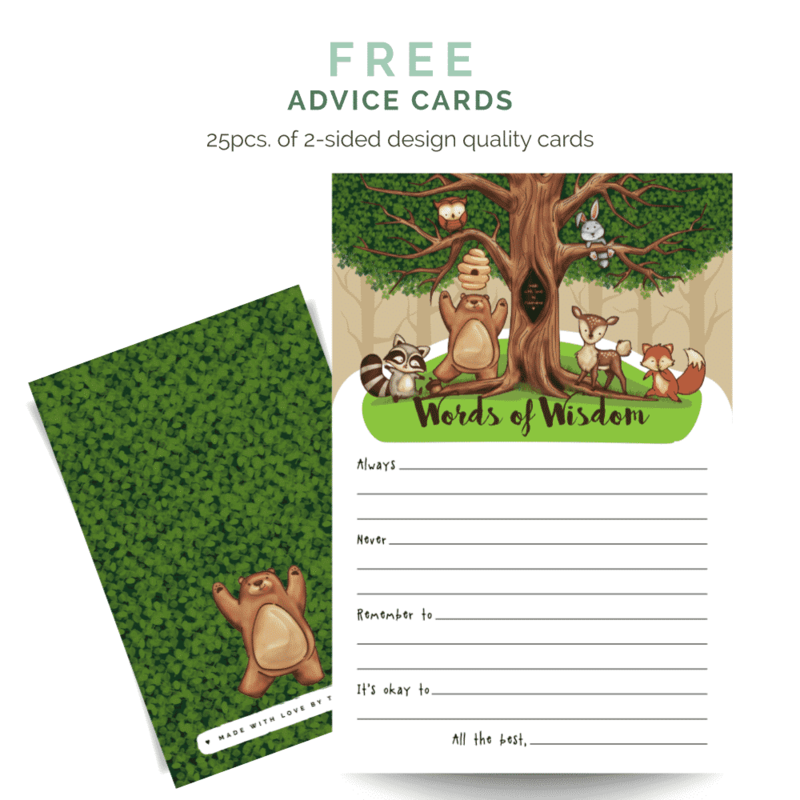 As a bonus, you also get non-toxic ink, 25 advice cards for your guests, and a display for the guest instructions. 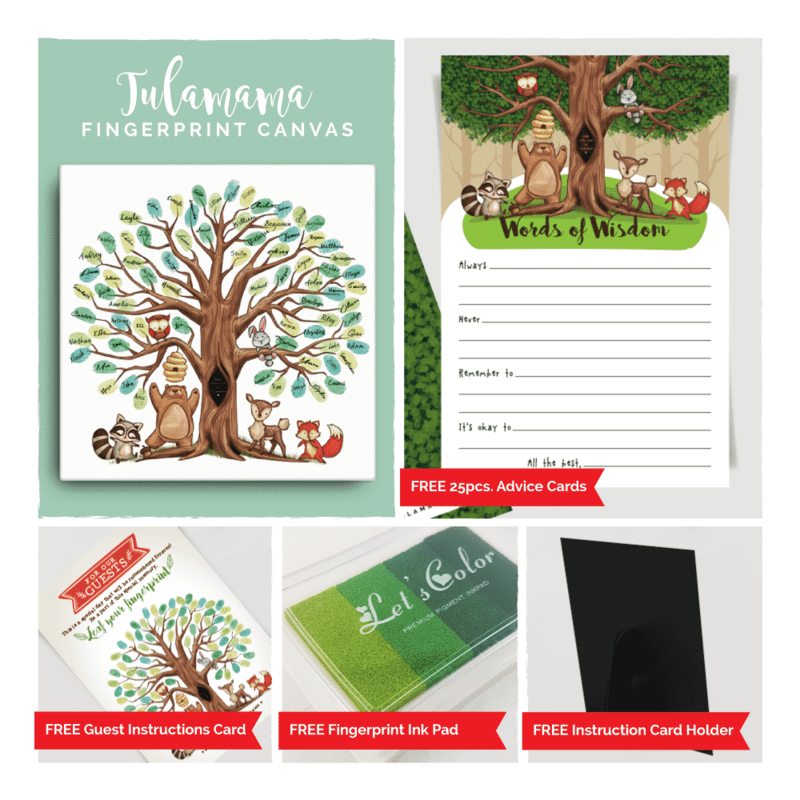 What is a fingerprint tree canvas used for? Our canvasses can be used for baby showers, weddings, parties or keepsake crafts. What are the fingerprint tree instructions? 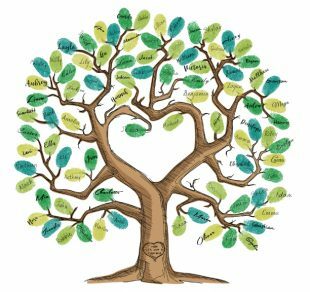 Whether you are using your thumbprint tree canvas for a baby shower, wedding or party, the instructions are super simple. Simply place your canvas, guest instructions, fingerprint inks, and pen (if guests will be asked to write their names) on a table. It is best to place it on a table near the entrance so that everyone can see it. Fingerprint inks are not messy but it’s always a good idea to leave wipes and a trash can for guests to wipe their fingers.